Led by Asia and the Middle East, the global petrochemicals market capacity is poised to grow from 1.5472 billion tpy in 2017 to 1.9315 billion tpy in 2026, says data and analytics company, GlobalData. 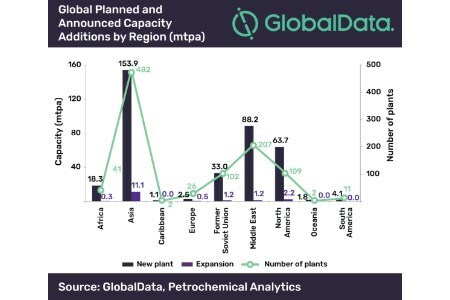 GlobalData's report, 'Semi-Annual Global Petrochemicals Capacity and Capital Expenditure Outlook', reveals that around 982 planned and announced plants are slated to come online, primarily in Asia and the Middle East, over the nine year period. Asia, the Middle East and North America will be the top regions contributing to capacity additions during the outlook period. Within Asia, with 244 out of the total 482 planned and announced petrochemical plants and a total capacity of 98.2 million tpy by 2026, China is the top country. Capital expenditure (CAPEX) for these plants in China is estimated to total US$51.6 billion. China Petrochemical, Zhejiang Petrochemical and Wanhua Chemical are the top three companies accounting for the major capacity additions in China. In the Middle East, the majority of capacity additions will be in Iran, with planned and announced capacity additions of around 63 million tpy by 2026. CAPEX for these plants totals US$27.9 billion. Sepehr Energy is the top company accounting for the major capacity additions in Iran. The US has 98 planned and announced petrochemical plants, with a total capacity addition of roughly 63 million tpy by 2026. The CAPEX for these plants is US$52 billion. Major capacity additions will be from IGP Methanol and NW Innovation Works. In South America, Venezuela plans to spend US$1.5 billion in the coming years to add a capacity of 2.1 million tpy. In the Former Soviet Union, the majority of capacity additions will be in Russia, with planned and announced capacity additions of approximately 24.6 million tpy by 2026. CAPEX for these plants totals US$23.2 billion. Sibur Holding is the top company accounting for the major capacity additions in Russia. In Africa, the majority of petrochemicals capacity additions will be in Egypt, with planned and announced capacity additions of around 10.1 million tpy by 2026. CAPEX for these plants totals US$12 billion in the coming years. In Europe, Poland plans to spend US$800 million to add capacity of roughly 900 thousand tpy, which is expected to come onstream by 2026.